I felt like a squirrel today. 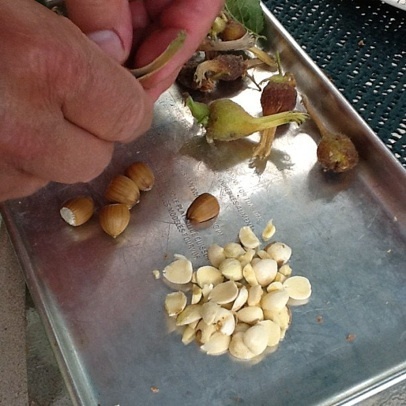 With my old pail and rubber gloves I went foraging for hazelnuts. Within less than 10 feet of my back door I was able to harvest an entire pail. Rubber gloves because the hulls protect themselves with prickles. As a kid I hated getting those little prickles stuck in my fingers. The hard part comes next, hulling and shelling. Then roasting. But they are totally organic. I felt like a pioneer. This entry was posted in News and tagged hazelnuts, organic, pioneer on August 17, 2012 by nurturingspace.